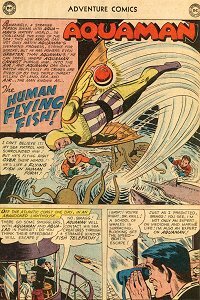 Adventure #272 (May 1960) - The Human Flying Fish! Recognizing that Aquaman is too powerful in the sea, a doctor proposes turning a man into a flying fish so he can rise above Aquaman's domain. Quotefile: Dr Krill, "All we need is someone with powers greater than Aquaman's! See those Flying Fish, Bragg? How'd you like to be like them... able to escape any pursuer by flying into the air?" Finny Friends Report: Aquaman summons whales to stop a group of smugglers. Aquaman's sea patrol attempts to stop the Human Flying Fish but fail. A group of whales help Aquaman to salvage an ancient idol from a sunken temple. A giant octopus throws Aquaman into the air after the Human Flying Fish. A grid of electric eels block the Human Flying Fish's escape route and shock him. Sailfish attack the helicopter and pierce the fuel tank. The Human Flying Fish is not the first to be augmented to face off against Aquaman, but the design and effort is somewhat different from what has come before. Usually the augments attempt to recreate Aquaman's abilities exactly (and his look for some reason). This effort started out good but Aquaman quickly used his intelligence to stop the threat.